“See Through Other Eyes: Spotted Owl” was installed in Lone Tree. CO, on May 16. The interactive stone sculpture is on display at The Vistas, Park Meadows Retail Resort from May, 2013 through May, 2014, as part of the Douglas County Art Encounters program. The Park Meadows Retail Resort is designed for the comfort and convenience of its patrons, a very impressive shopping destination! Shop, dine, visit the Owl–all the amenities are here! 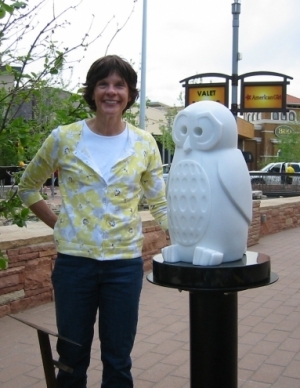 The Owl has made quite a tour of Colorado through Art In Public Places municipal exhibits. Loveland was the first city to host the sculpture through The Art Advocacy Project in 2010-2011. Next he flew to Evergreen and was hosted by Sculpture Evergreen for 2011-2012. He then came to roost in Highlands Ranch in front of the public library as part of Douglas County’s Art Encounters in 2012-2013. Douglas County is again hosting the owl as part of Art Encounters for 2013-2014 in Lone Tree.